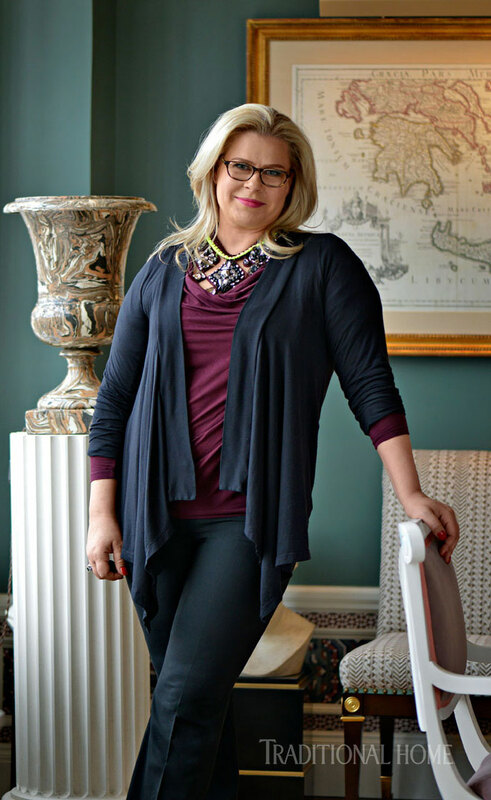 Regardless of whether the occasion is personal or professional, one thing is certain when design maestro Alexa Hampton entertains. Laughter is in store. And that’s just her audio design. She presents an equally pleasing visual statement too. 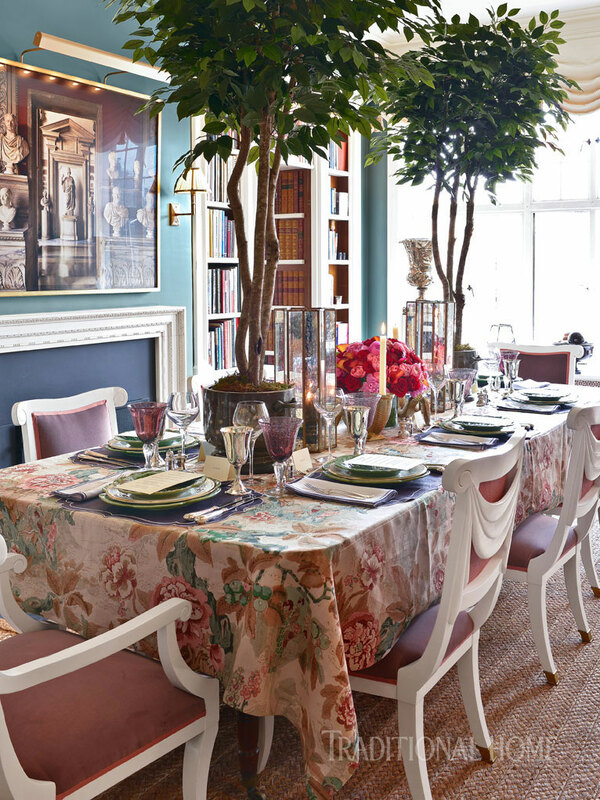 “Chinese Lantern” linen fabric from Lee Jofa and “Abigail” side chairs with draped backs from Hickory Chair establish the palette for the dinner’s design. Mercury glass hurricanes from The Mine and a formal arrangement of flowers in reds and pinks from Ariston Flowers march down the middle of the table. To celebrate the newly launched design emporium The Mine, where Alexa serves as creative director, she gathered a group of industry friends for dinner in her New York apartment. In the spirit of her guests’ aesthetic mind-sets, the event was layered with pattern, color, and texture inspired by a chinoiserie floral in rose, purple, and green. 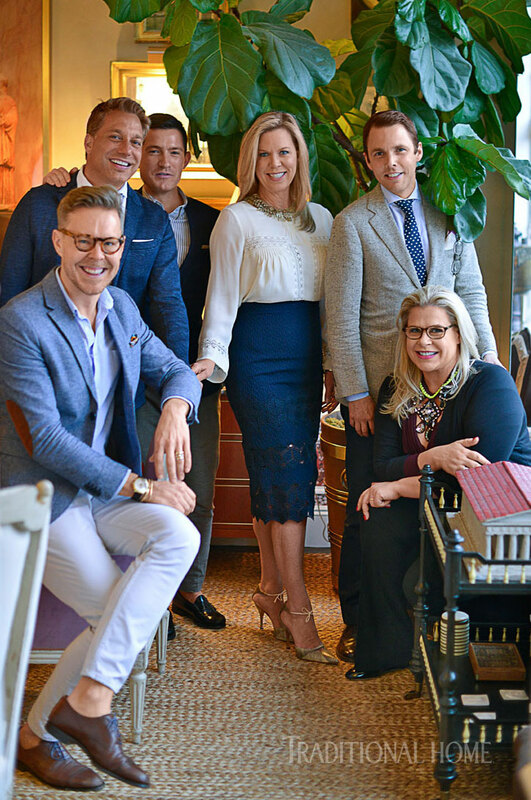 Alexa with designers, from left: Eddie Ross (also The Mine style director), Thom Filicia, Nick Olsen, Ashley Whittaker, and New York School of Interior Design President David Sprouls. An unexpected pairing of textured cabbage plates and a simple ivory-and-gold plate is grounded by a grape-colored, scalloped placemat that is stylish yet practical with its wipeable surface. A lavender napkin with grape embroidery reverses the color proportions. Laminated linen placemats with an arabesque edge take a reversed two-tone twist with coordinating napkins from La Gallina Matta. 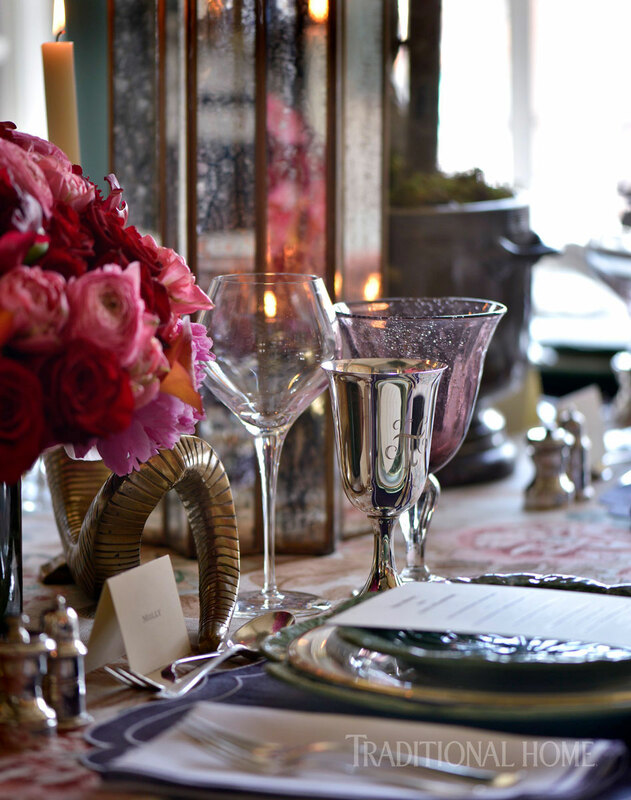 Antique silver, including the flatware, salt and pepper shakers, and engraved goblets, adds something storied from Alexa’s personal collection. 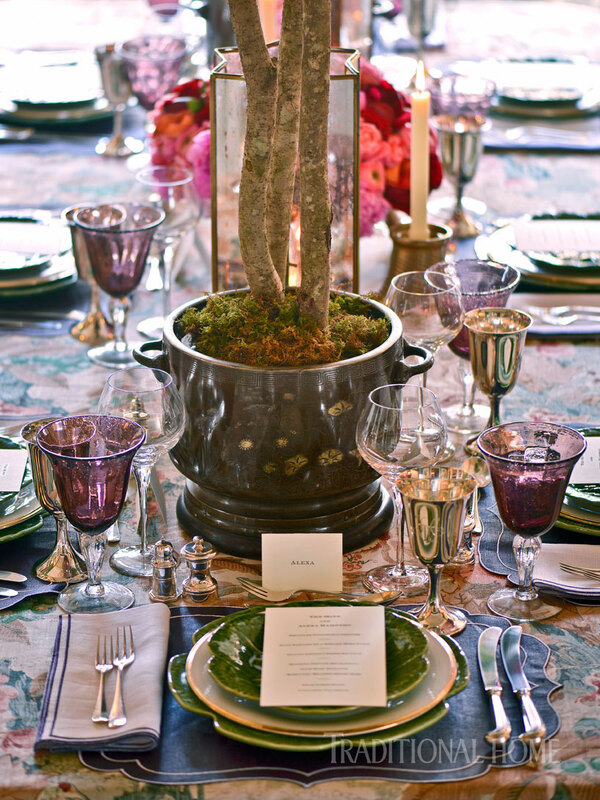 The table’s centerpiece is a mélange of curiosities: soaring lemon trees, mercury glass hurricanes, red and pink flowers, and spiraling horns. “Soaring plants create a canopy and offer a fun way to contend with a room without a chandelier,” says Alexa. Amethyst and clear stemware from The Mine dazzles with engraved silver goblets. 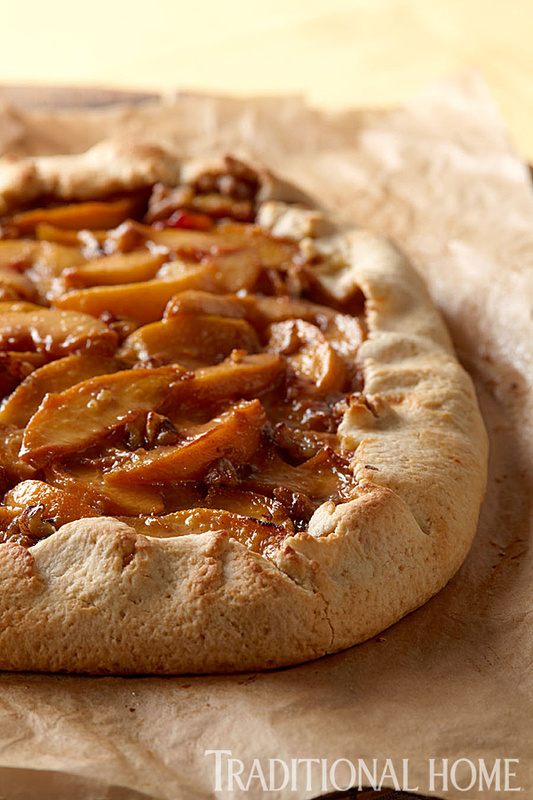 The tasteful menu includes an Asiago cheese soufflé, Burgundy-braised short ribs, and an elegant-but-easy pear tart. 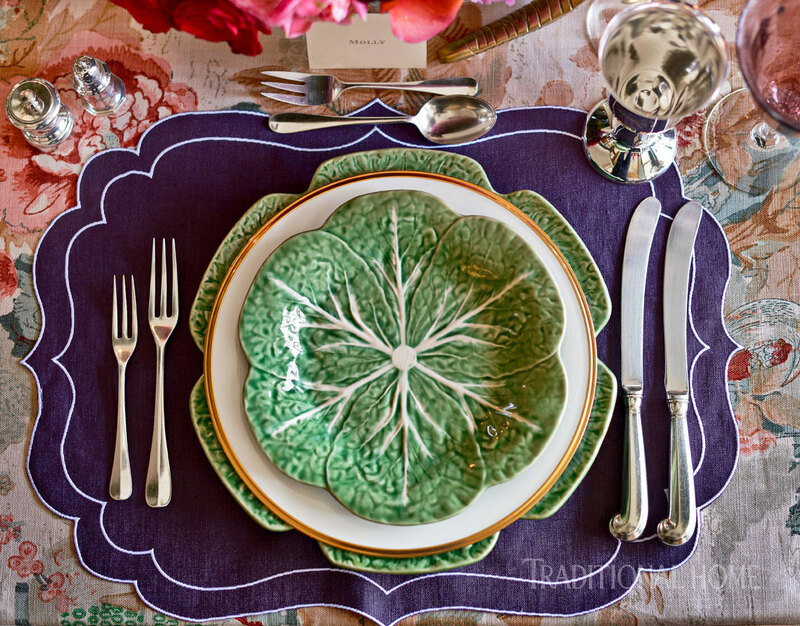 Bordallo Pinheiro “Cabbage” plates are made formal with the gold-rimmed “Eternal” pattern from Lenox. 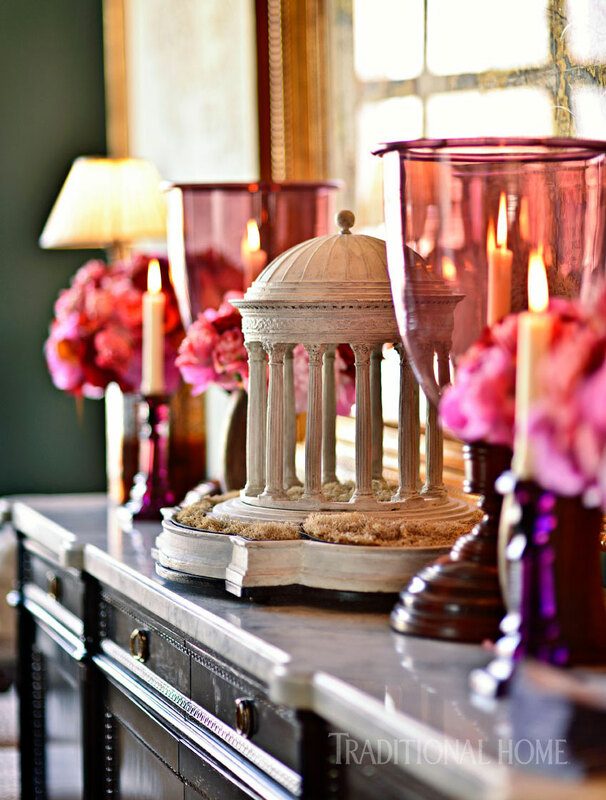 The sideboard boasts a profusion of pinks and purples in floral arrangements and on glass amethyst candlesticks and hurricanes from The Mine. The Mine Creative Director Alexa Hampton. When Alexa Hampton entertains, it’s a formal affair with a casual vibe. The menu veers toward classic comfort food with a modern twist. To accomplish this balance, Hampton turns to New York catering guru Stephen Kennard and his prestigious catering firm Canard, Inc.
Kennard gravitated to the world of evolving American cooking in the early 1970s and was executive chef at Wertheim & Co. and Institutional Investor magazine. In the early 1980s he wrote about food and restaurants for GQ magazine. He began his company in 1985 by serving friends, and he has grown and developed Canard into a prominent catering service with a blue-chip client list. Recipes are by Canard Inc. executive chef Jose Delgado. 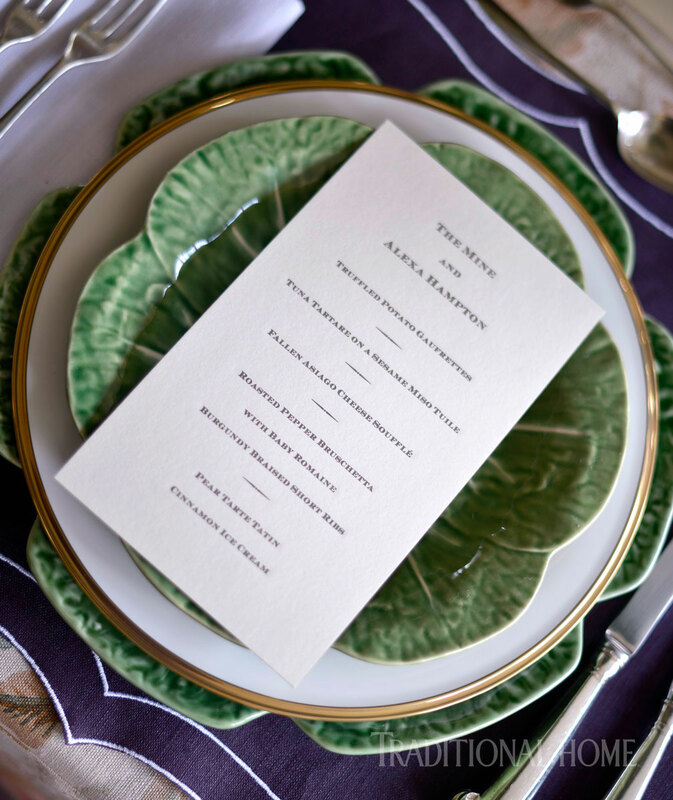 Placecards and menu cards from Thornwillow Press bring classic simplicity to the dining suite. Note: Unless specified, when we call for “butter” we mean the unsalted variety. When we call for “olive oil” we are suggesting good-quality extra-virgin. When we call for “eggs” we are suggesting large eggs. 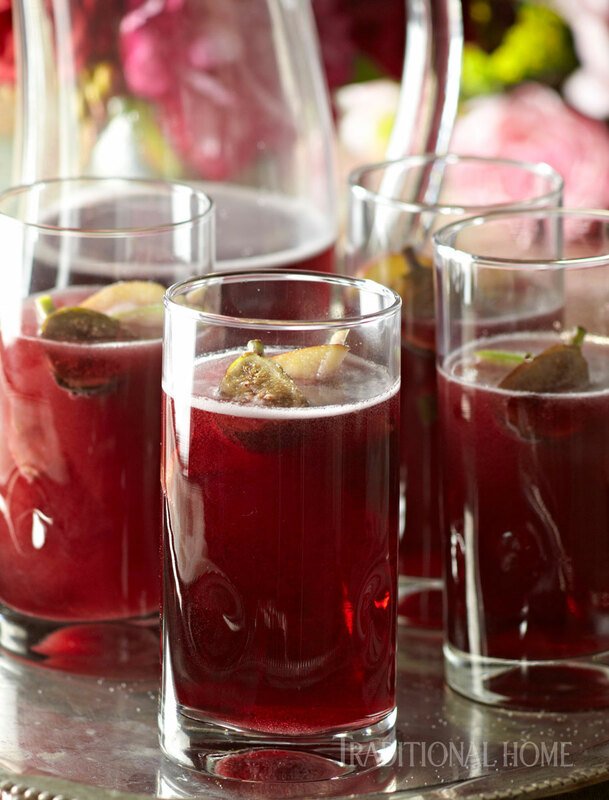 This red wine-based sangria is a lovely way to start a fall supper. In large pitcher, combine fruit, brandy, and Simple Syrup. Stir to combine. Add wine. Cover pitcher; chill 2 to 4 hours. To serve, add sparkling apple cider. Stir gently. Pour sangria over ice. Garnish with some of the fruit. Makes 8 servings. *Tip: To make Simple Syrup, in small saucepan combine 1/3 cup water and 1/3 cup sugar. Cook and stir over medium heat until sugar dissolves and mixture just comes to simmer. Cool completely. 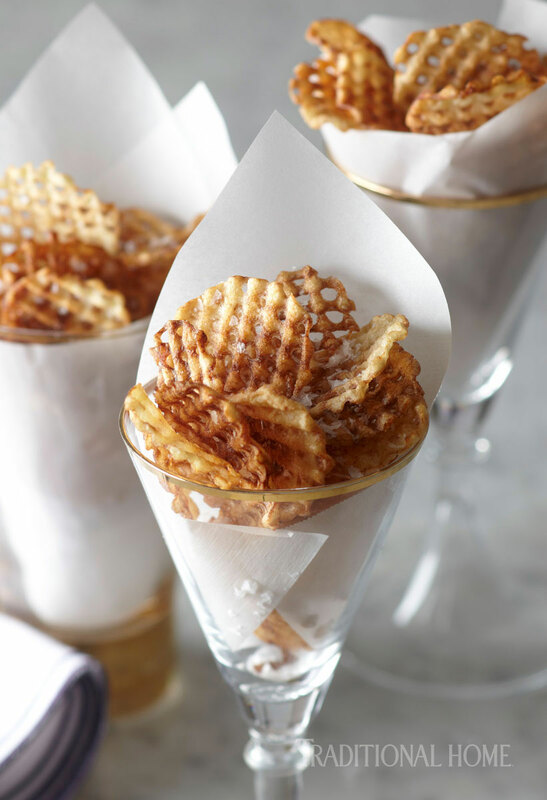 These salty, crisp potato chips are an elegant complement to cocktail hour, especially if dinner is an elaborate affair. They’ll satisfy hunger pangs without filling up your guests. You’ll need a mandoline to make these gaufrettes. Click here to see some of the latest on the market. Peel potatoes; reserve in cold water. 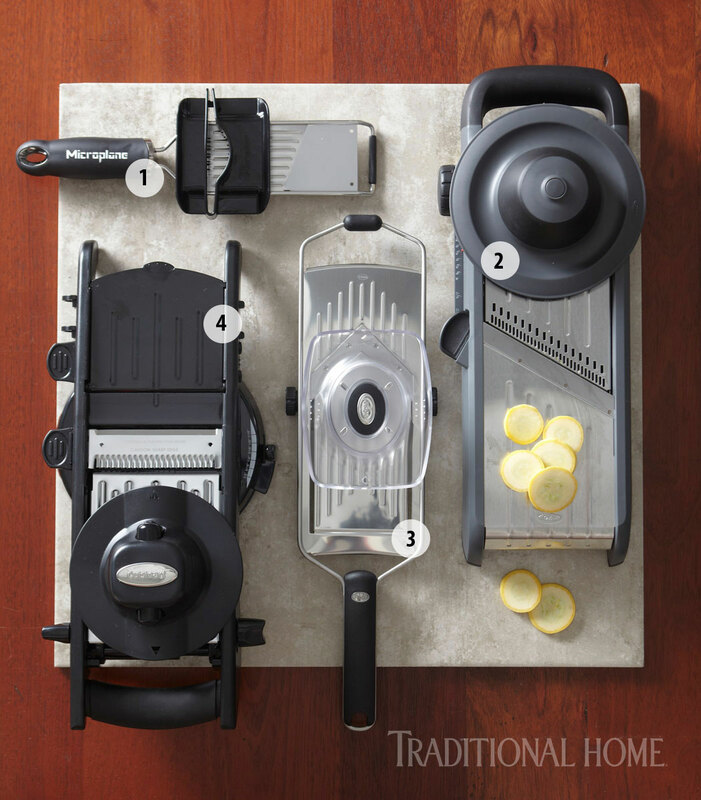 Fit mandoline slicer with ruffled or zigzag blade; cut narrow ends off potatoes. Carefully slice potatoes 1/16 inch thick, rotating potato 90 degrees with each slice to make waffle-cut slices; reserve slices in cold water. Fill large heavy saucepan with 1-1/2 inches vegetable oil. Heat oil to 350°F on deep-frying or candy thermometer. In small batches, drain and pat dry potato slices. (Slices need be dry to prevent splattering.) Fry until golden brown and crisp, 3 to 4 minutes per batch. Remove; drain on paper towels. Sprinkle lightly with sea salt and drizzle with white truffle oil. Makes 3 cups (about 30). 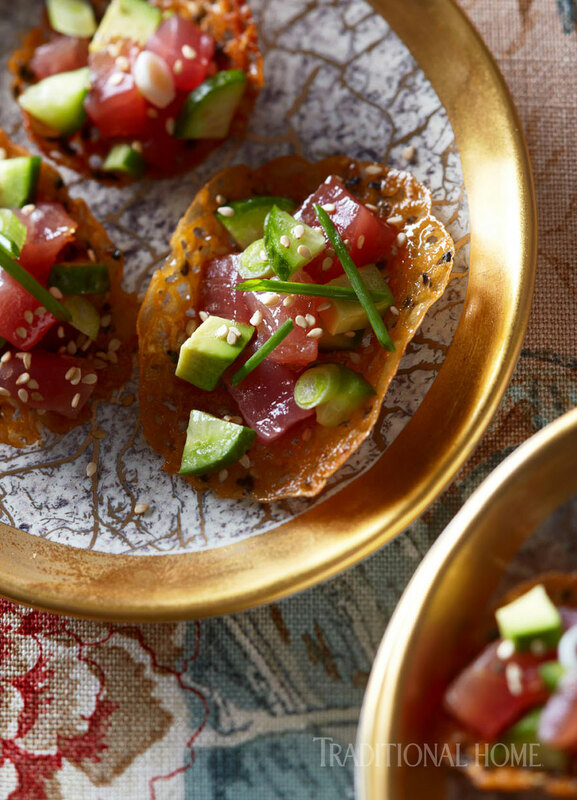 Michael Wainwright’s “Tempio Luna” canapé plates serve up tuna tartare hors d’oeuvres. A riff on both classic steak tartare and sushi, these delicious hors d’oeuvres are loaded with umami flavor. In medium bowl whisk together soy sauce, rice wine vinegar, lemon juice, wasabi paste, and sesame oil. Add tuna, avocado, cucumber, and green onion; stir gently to coat. Spoon mixture onto Sesame Miso Tuiles. Sprinkle with sesame seeds and chives. Top with caviar, if desired. Makes 24 servings. *Tip: Wasabi paste (horseradish paste) can be found in Asian markets and most supermarkets. In small saucepan, combine corn syrup and butter; melt over medium heat (do not boil). Remove from heat; whisk in miso paste and sesame oil. In small bowl stir together flour, ginger, salt, and pepper. Add flour mixture to butter mixture; whisk until smooth. Stir in black sesame seeds. Set aside to cool (about 1 hour). Preheat oven to 325°F. Place rack in center of oven. Line large baking sheets with parchment paper. Using about 1 teaspoon mixture for each tuile, spoon twelve portions of the mixture into 1-inch circles 3 inches apart on each prepared baking sheet. Bake about 8 minutes or until golden brown (tuiles will spread and become lacy). Remove from oven. Let stand 30 seconds or until easy to remove. Quickly move tuiles onto rounded surface (rolling pin, end of whisk, etc.) to create curved effect. Let cool thoroughly. Makes 36 tuiles. Note: Tuiles can be made a day in advance and stored in an airtight container. For this recipe, you’ll want to have everything ready to go before you start cooking: eggs separated, ingredients pre-measured, stand mixer set up, and oven preheated. Chill the mixing bowl and the beaters for the egg whites in the freezer beforehand. 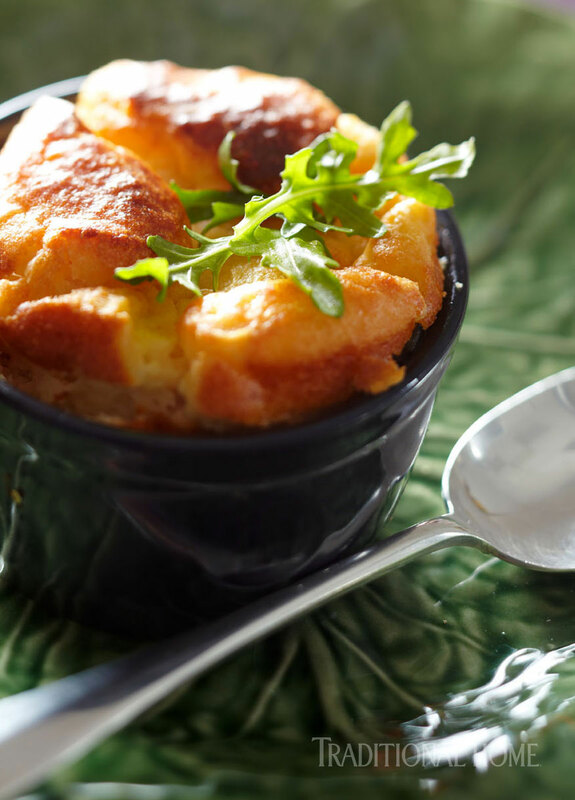 The peppery arugula garnish adds snap to the richness of the soufflé. Asiago cheese soufflés are baked in Emile Henry ramekins. Allow egg yolks and egg whites to stand at room temperature 30 minutes. Preheat oven to 350°F. In medium saucepan melt butter; stir in flour, dry mustard, and cayenne pepper. Add milk all at once. Cook and stir over medium heat until thickened and bubbly. Remove from heat. Gradually add cheeses, stirring until melted. In medium bowl beat egg yolks with fork. Slowly add cheese sauce to egg yolks, stirring constantly. Cool slightly. In large mixing bowl beat egg whites with electric mixer on medium to high speed until stiff peaks form (tips stand straight). Gently fold about 1/2 cup of stiffly beaten egg whites into cheese sauce. Gradually pour cheese sauce over remaining stiffly beaten egg whites, folding to combine. Pour into 8 ungreased 8- to 10-ounce soufflé cups or ramekins. Bake 40 minutes or until knife inserted near center comes out clean. Remove soufflés from oven. They will puff, then fall in center. Garnish each soufflé with small amount of arugula. Serve immediately. Makes 8 servings. Served directly on bread, like a tartine, this course has a different (and modern) approach to a traditional salad. It’s still a knife-and-fork affair though. Preheat broiler. Place rack in center of oven. 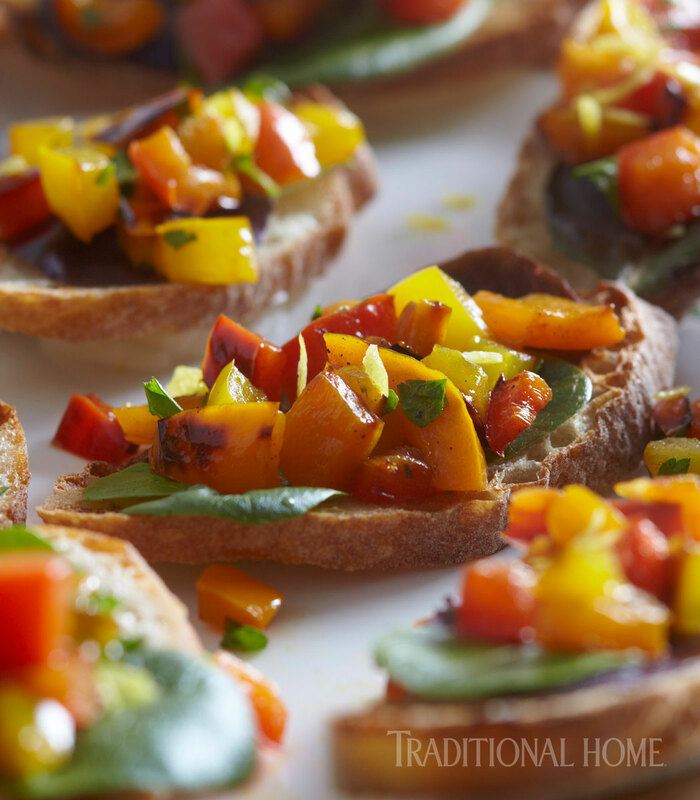 Bias cut ciabatta into eight 1/2-inch slices; brush lightly with 2 tablespoons olive oil. Place ciabatta under broiler; toast until golden. Set aside. In large skillet heat 1 tablespoon olive oil. Cook garlic 1 minute or until softened. Add peppers. Cook and stir 4 minutes or until tender. Remove from heat. In small bowl combine 1-1/2 tablespoons lemon juice, salt, and black pepper. Whisk in remaining 1 tablespoon olive oil. Toss sweet pepper mixture with lemon juice mixture. Sprinkle with 1 teaspoon lemon zest. Top toasted ciabatta with romaine leaves. Spoon peppers onto romaine. Makes 8 servings. Tip: Ciabatta slices may be toasted ahead of time. Wrap toasted slices in plastic wrap and reserve until serving time. Rich, aromatic, flavorful—does fall cooking get better than this? 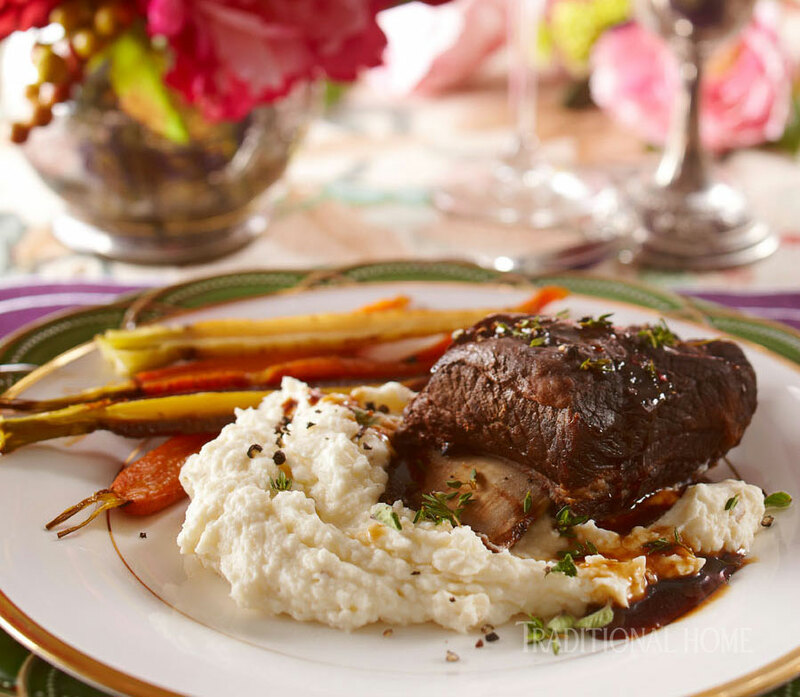 Don’t leave anything to chance: Order the short ribs from your butcher a few days in advance. Preheat oven to 350°F. Sprinkle ribs with salt and pepper. In 8-quart Dutch oven, heat oil over medium-high heat. Cook ribs, in batches, 3 minutes per side or until browned. Remove from Dutch oven. Drain all but 2 tablespoons fat from pan. Reduce heat to medium. Add onions, celery, and chopped carrots to fat in Dutch oven. Cook, stirring occasionally, until tender, 5 to 7 minutes. Add flour and tomato paste. Cook and stir 1 minute. Add red wine. Bring to boil. Reduce heat; simmer about 15 minutes or until wine is reduced by half. Stir in beef broth, fresh herbs, and garlic. Return ribs to Dutch oven with any accumulated juices. Bring to boil, cover; place in oven. Braise 2 to 2-1/2 hours or until beef is fork tender and just falling off bone. Transfer ribs to platter; cover with foil. Strain cooking liquid into large saucepan and skim fat off surface. Bring to boil. Reduce heat; simmer until reduced by half, about 30 minutes. While sauce is simmering, place heirloom carrots on roasting pan. Drizzle with olive oil; sprinkle with salt and pepper. Roast in oven 30 to 35 minutes, or until tender. To serve, spoon Creamer Potato and Celery Root Puree onto serving plates. Top with short ribs; spoon sauce over. Serve roasted carrots on side. Makes 8 servings. Tip: This recipe may be made a day in advance and reheated slowly, covered, on stovetop—the flavors will concentrate. Place celeriac pieces in 5- to 6-quart pot; cover with water and season with salt. Bring to boil; reduce heat and cook, covered, 10 minutes. Add potatoes. Return to boiling. Reduce heat; cook, covered, 10 to 12 minutes more or until potatoes and celeriac are tender, but not mushy. Drain potatoes and celeriac. Use ricer or food mill to mash until smooth. Return to pot. Stir in sour cream and butter. Season with additional salt and white pepper. Serve immediately or cover and keep warm over low heat up to 1 hour. Makes 8 servings. 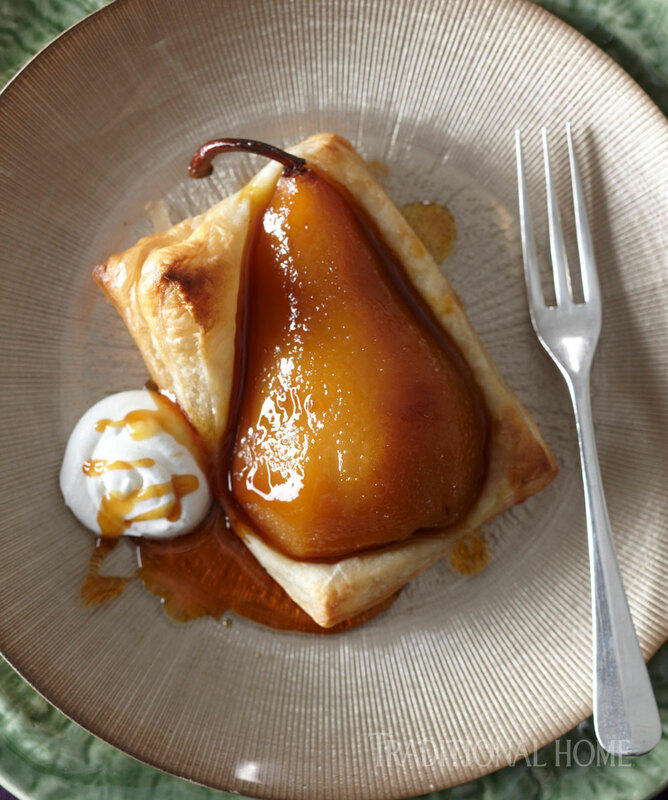 These pear tarts are works of art without much work. Just watch over the sugar syrup and caramel carefully. Choose blemish-free pears that have just a touch of give when pressed—you don’t want them too under- or over-ripe. Add butter to melted sugar in skillet, stirring until butter melts and mixture is combined. Carefully add water to skillet, stirring to combine. Bring to boil, stirring to dissolve any lumps. Add pear halves in one layer. Reduce heat to medium-low; cover and simmer 15 to 20 minutes or until pears are tender, turning once. Remove pears from skillet, reserving liquid. Set pears aside to cool. Meanwhile, bring sugar mixture in skillet to gentle boil. Cook, uncovered, for 8 to 10 minutes or until thickened and reduced to 1 cup, stirring occasionally. Preheat oven to 400°F. Place rack in middle of oven. Line large baking sheet with foil or parchment paper; set aside. Unfold puff pastry sheets; cut each sheet in quarters. Place on prepared baking sheet. Place one pear half, cut side down, on each piece of puff pastry. Trim pastry to leave 3/4-inch border around pears. Brush each pear half lightly with some of the caramel syrup. Bake 25 minutes or until pastry is puffed and golden brown. Serve tarts warm drizzled with remaining caramel and whipped cream, if desired. (Caramel may stiffen; warm caramel in microwave if necessary.) Makes 8 servings. Our most serious concern using a mandoline is keeping your fingers safe from accidental cuts. Here are suggestions for keeping your digits intact. Always, always wear a protective mesh glove when using a mandoline. The Cuisinart model comes with a cut-resistant glove. If you don’t have one, this Microplane Cut-Resistant Glove is machine-washable and lightweight. The glove will help prevent cuts should the food guard slip. Always use the food guard (or “food pusher,” as it might be labeled) to anchor your food as you guide it toward the slicing element. It will provide a sturdy holder, especially for thicker foods such as apples or squash. Most mandolines have some sort of a slip-resistant base or feet. We recommend upping the ante here. For handheld models, place the mandoline over a bowl to catch the slices rather than resting the tool against a counter or cutting board. For countertop styles, decrease the chance of slipping by placing the mandoline on a cutting board placed on a wet dishtowel on the counter. This should help keep the mandoline in place. Cut food into manageable pieces. Halve bell peppers crosswise, cut zucchini and yellow squash into thirds, and slice potatoes in half crosswise. Anchor food to the food guard at the narrow end. Take note: you don’t need to use every bit of the vegetable you are slicing. Forcing the little end pieces through the slicing blade is when you are most likely to scrape your fingers. The tail ends of potatoes, carrots, and other vegetables should be removed from food guard and tossed or composted. Familiarize yourself with how to change and remove the blade components. Wear the glove (!) when changing blades or removing them for cleaning. Most gloves are washable so wear the glove when cleaning the blades or stationary slicing elements. Before slicing foods, rub the ribbed cutting surface of the mandoline with a little non-flavored cooking oil. This will help the food glide easily toward the blade without affecting the flavor. Practice, practice, practice. It takes a little time to master using a mandoline, but once you get it you’ll be on your way to making perfect potato gaufrettes, French fries, and paper-thin radishes or cucumbers for Asian-inspired rice wine vinegar salads, among other treats. And if you didn’t get the point before, WEAR THE GLOVE. Check out these scrumptious pastry recipes from Chef John Besh.